SYSTEMS OF OPPRESSION, INEQUALITIES AND INEQUITIES ARE BY DESIGN. SHOULDN’T WE USE DESIGN TO DISMANTLE THEM? Did you know that you’re a designer whether you’ve studied within a design field or not? As a teacher, nurse, politician, graphic designer, etc., your “designs” (also known as plans or decisions) impact others. How can we make sure that you’re designing inclusive and equitable outcomes for all - no matter how big or small the decision? In addition to the practices of social innovation and organizing, some people have started to use creative problem solving processes, such as human-centered design and design thinking, to address injustices. However, these methodologies in their current state are not enough to combat these complex human systems. At Creative Reaction Lab, we pioneered a framework called Equity-Centered Community Design (ECCD) that acknowledges and utilizes the role of people + systems + power when developing solutions or approaches that impact the many. Equity-Centered Community Design, created by Creative Reaction Lab, is a unique creative problem solving process based on equity, humility-building, integrating history and healing practices, addressing power dynamics, and co-creating with the community. 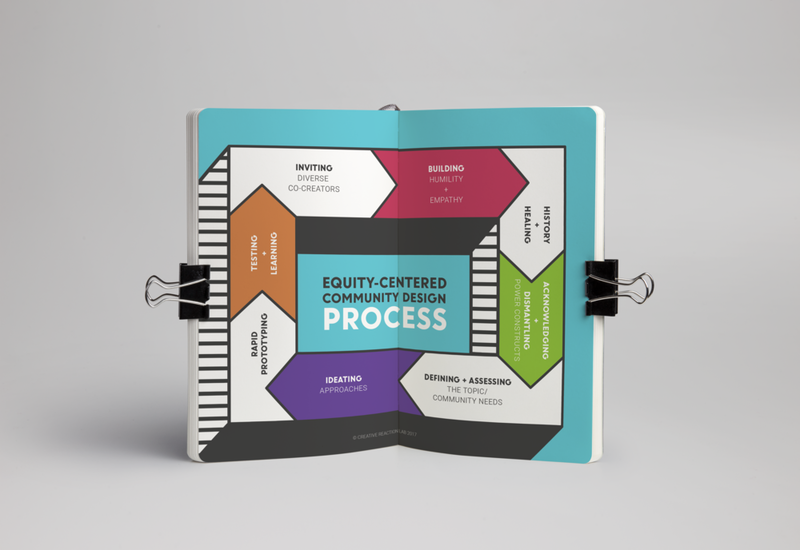 This design process focuses on a community’s culture and needs so that they can gain tools to dismantle systemic oppression and create a future with equity for all. Creative Reaction Lab’s goal is to share equity-centered design to achieve sustained community health, economic opportunities, and social and cultural solidarity for all. Creative Reaction Lab would like to thank Sappi Ideas that Matter for helping make the field guide a possibility.